I was really interested in checking out the latest effort from the boys from West Virginia, specifically because it is their first record without bassist, backing vocalist, and songwriter Jerod Mankin. Would BOBAFLEX survive without him? Would they continue on their current music path, return to the past, or divert into a new direction? These were all questions I needed answered…and the answers are on Anything That Moves. I kicked things off by skipping straight to the album’s first single “Mama (Don’t Take My Drugs Away)”. I was immediately immersed in the nostalgic feelings of the band’s 2007 release Tales From Dirt Town. I knew right away that this album had potential. “Mama” is a mid-tempo rocker with a great guitar hook. Add the signature vocal harmonies during the verses (a BOBAFLEX staple) and you have the makings of an excellent single that could never be mistaken as anything but BOBAFLEX. I love all of the oldie BOBAFLEX songs, so much so that I still harass Shaun and Co to add “Doomwalker” back into the set, so this song was right in my wheelhouse. I couldn’t wait to listen to the rest of the record. The rest of the record is a mixed bag of songs that seem to display multiple facets and moods of the band that any fan, new or old, can appreciate. “Start A War”, the album’s opening song after a brief intro, is a ballsy, fast song that is just pure krunk. “Dry Your Eyes” was written very much in the same vein as “Bury Me With My Guns On”. The record closes with three standout tracks, “Pray To The Devil”, “End Of The World” and “Forgiven”. “End Of The World” in particular gave me that giddy nostalgic feeling once again. To answer my previous questions, yes, there is BOBAFLEX after Jerod and it seems as though the McCoy brothers Shaun and Marty, alongside drummer Tommy Johnson, guitarist Dave Tipple and newcomer bassist Jymmy Toland have pieced together an excellent new record that seems to encompass an entire career. 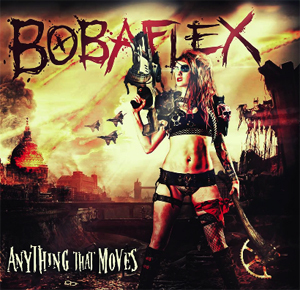 Anything That Moves is not a risk-taker, but it is still what I would expect from BOBAFLEX. Longtime fans as well as new fans – rejoice! Get your copy of Anything That Moves in the KNAC.COM More Store right HERE.